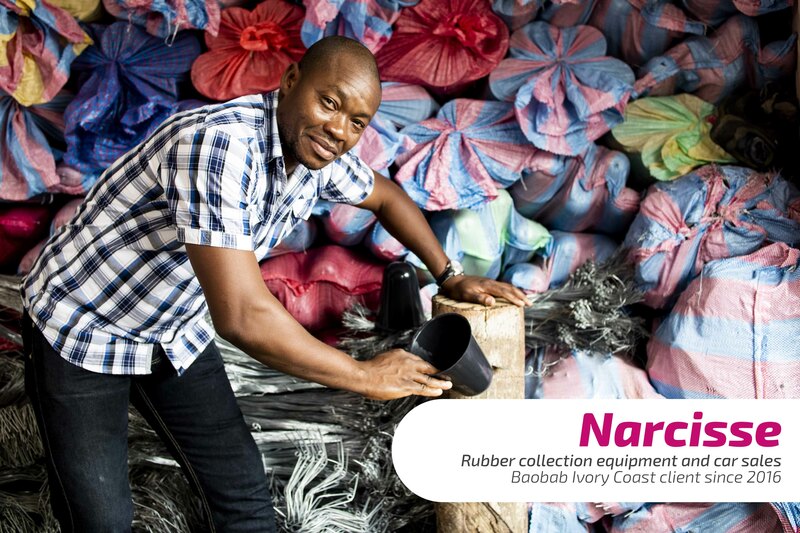 Narcisse is a 38 year old entrepreneur in Ivory Coast working in the rubber industry. He started his business selling equipment for rubber collection in 2011. In the beginning there was only one supplier willing to sell merchandise on credit. This limited the potential of his business considerably, and he needed to find another solution with more supplier options. Finally, a friend of Narcisse directed him to Baobab in 2016. In less than 2 weeks he received a loan that he was easily able to repay. Narcisse was able to select better suppliers, increase the volume of his merchandise and improve his sales. Six months later, Narcisse renewed his loan and got into car sales. Once again, with the loan he was able to expand and diversify his income. In addition he was able to hire 2 new employees and a driver. Today, he is in his 4th loan cycle, and in the future, he hopes to be able to purchase a house for his family.